When I worked for Urban Locavore, we curated a monthly tasting box featuring 7-8 West Australian products. Katrina Lane’s name would often pop up in conversation, she was Paul’s go-to person for the produce of the South West. When Paul wanted to know what new local products were available, he would make a phone call to Katrina because “Katrina would know”. 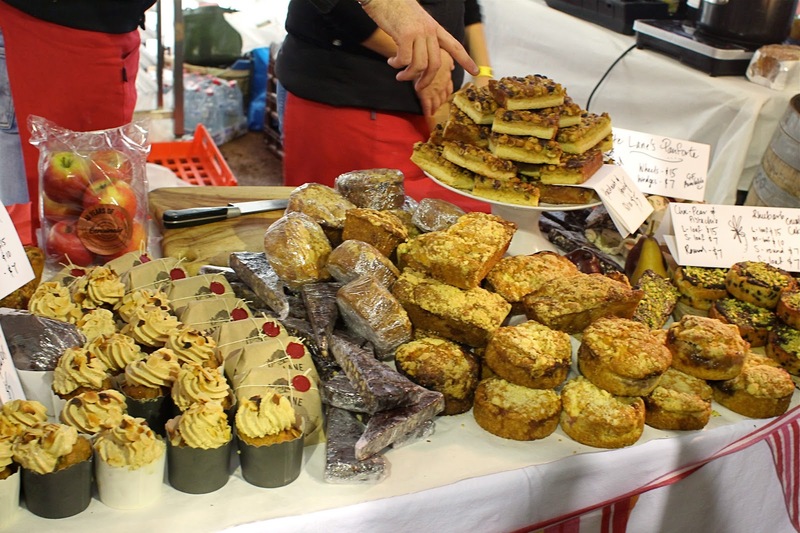 Katrina Lane is the cook/owner of Taste of Balingup, her café supports local farmers and gives the community an opportunity to connect with those who produce their food. When I try to explain to someone who Katrina is, I like to say that she is Perth’s version of Maggie Beer – a champion and steward of local produce, and in her company you feel nothing but warmth and passion. If you follow Katrina’s Taste of Balingup Facebook page, you’ll see that her commitment to local produce is unrelentless and she is always questioning where our produce comes from and exposing misleading claims. While I was travelling around Japan in June, I received a message from my friend Anthony who invited me to Katrina’s Winter Solstice dinner at her home in Balingup when I was back. I was excited to meet Katrina for the first time and we hit it off. I had an amazing weekend feasting on a whole lamb cooked over a campfire. Over this weekend, I also learnt more about the Sunday long table lunch Katrina was organising for the Truffle Kerfuffle under Food, Land, Culture, a new initiative she has set up with two other formidable women in the Perth food scene – Chef Sophie Budd and gastronomic stalwart Bella Bushell. Food, Land, Culture seeks to reconnect farmers and consumers, and build a culture where people think more about where their food comes from. For the Truffle Kerfuffle, it brought together a dozen Southern Forest growers and top Perth chefs for the “Farmers” Long Table. I had never been to the Truffle Kerfuffle before but always wanted to check it out. 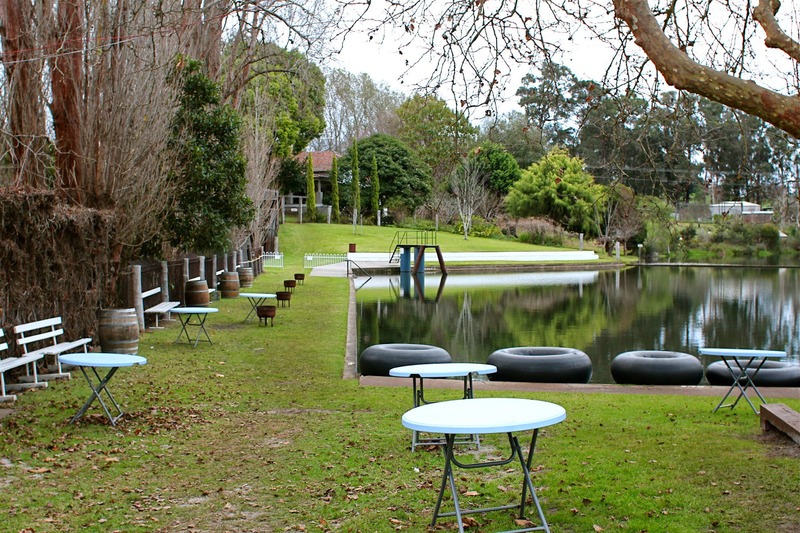 When Katrina told me I was welcome to stay with her in Manjimup, I had no more excuses not to go! I bought tickets to the Truffle Beer Masterclass on Saturday with Hadleigh Troy of Restaurant Amuse and Paul Wyman from Colonial Brewery, and the Sunday Southern Forests Farmers’ Long Table Lunch. 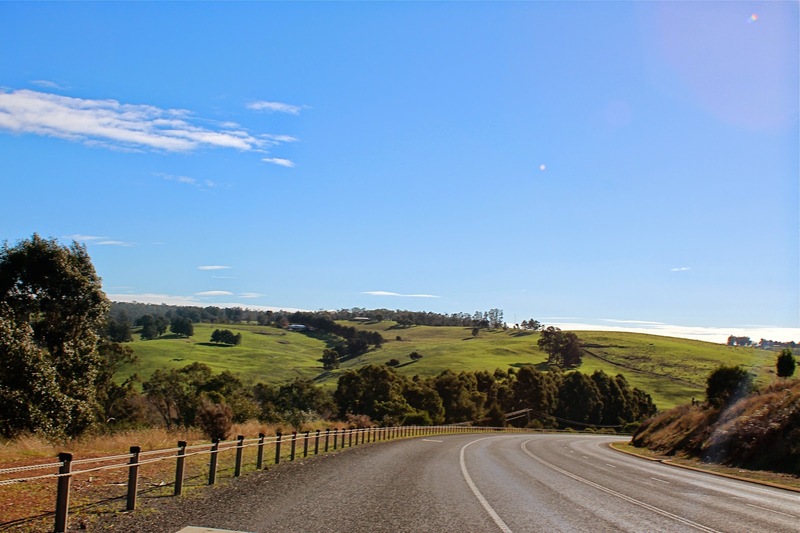 I’ve driven to Margaret River heaps of times before but never to Manjimup, and one thing that I noticed was how much more scenic the drive to Manjimup was. 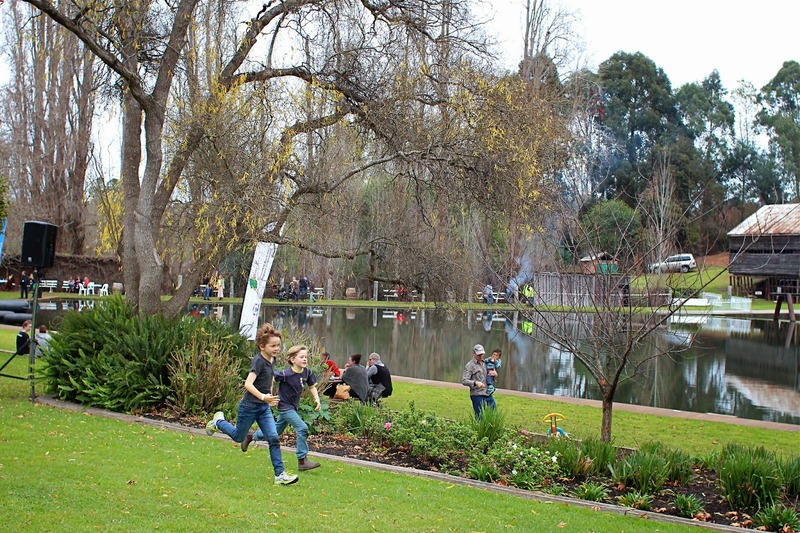 Manjimup is known for its thriving fruit and vegetable industry, there is so much lush greenery as you pass lots of beautiful forests, hills and rich farmlands on your drive down. On arrival to the Truffle Kerfuffle at Footy’s Pool on the Saturday morning after a 3.5 hour drive from Perth, the first thing I did was head to Katrina’s Taste of Balingup stall to get some food. There was an amazing array of sweet and savoury treats, and truffle popcorn to go, but one thing in particular tempted me more than anything else. When I first laid eyes on the truffled croque-monsieur, I knew that I would have no other choice. 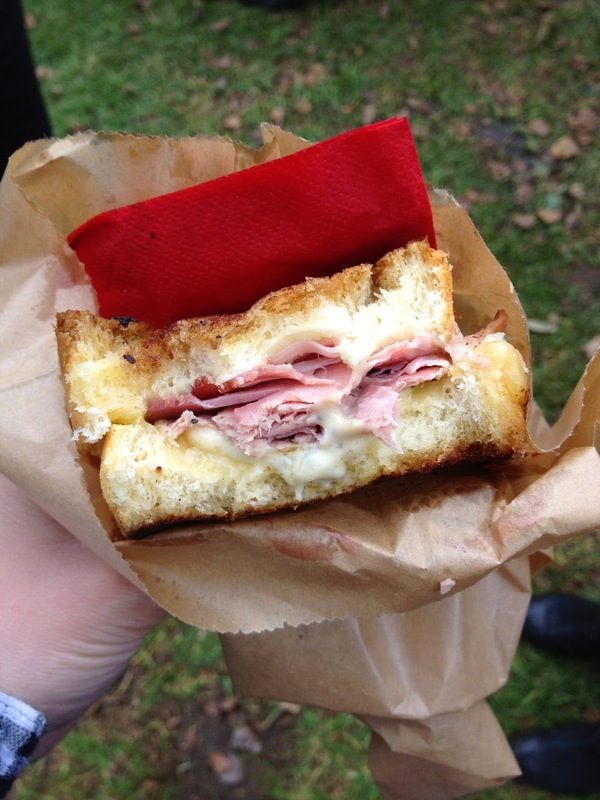 Thick pieces of buttery toasted brioche filled with thin slices of ham and truffled béchamel. It was a winner for a tenner. At the end of Saturday, I helped Katrina pack down her stall and we headed home to our safe house on Fontanini's Fruit and Nut Farm which was right across from Footy’s Pool, over the creek. But I was almost homeless as we picked up our cars from separate areas to regroup, I got a bit lost and there is no (well very limited but none for me) reception in Manjimup. Over the weekend, it was funny to see the lack of capacity for anyone to be able to communicate with each other, especially when you are a part of and trying to organise things for a festival! But it was also good to be phone free for a whole weekend. Luckily I was picked up on my wonderings after hours by Bella who had gone back on site to pick up something. But work wasn’t over for the day yet as there were still many last minute things to do for the long table lunch the next day, and I assisted Katrina, Sophie and Bella with putting together the gift bags which involved putting some rice in a little plastic bag with an egg and a piece of truffle (x150). Tough job I know but someone had to do it! It was also great to learn more about their plans for the lunch and one thing which was good to know was that the producers and chefs involved would get compensated for their input. Often at events, a lot of stuff is sourced for free/sponsored, so it was refreshing to find out that the $125 I had paid for the lunch would go directly back to the people who made it possible because they deserve it. After all our hard work, we feasted on sausages for dinner, topped with truffles and downed with wine and a keg of Colonial Brewery’s truffle beer. Joel Valvasori-Pereza's pork sausages and truffles. NB: There is no such thing as too much truffle. The next day everyone was up early, most at 6am to get back to Footy’s Pool to set up lunch, only I had the luxury of sleeping in. But before I left the house I did all the dishes and cleaned up the food and drink carnage left from the night before. It was the least I could do. I got into the Truffle Kerfuffle around 10:30am on Sunday, hoping to have a bit of a browse around before the lunch started and dropped in to see how the set up for the Long Table Lunch was going. 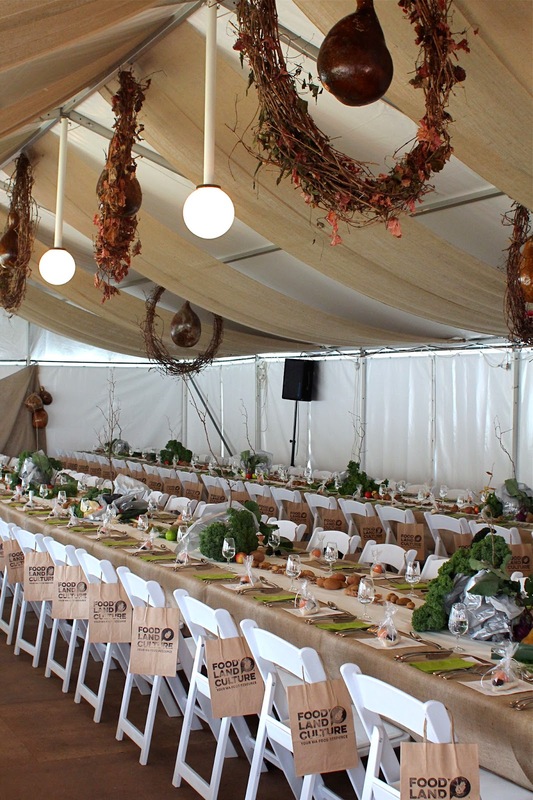 There was a flurry of activity as everyone tried to get everything together in time and seeing this I could not help but pitch in – distributing the menus, folding the napkins for the tables and finishing off the produce display at the front. It was incredible to see an idea that I had heard so much about all come together and be a part of making it happen. The aim of creating a link between the local produce and diner was executed at a level that I had not experienced before. It was beautiful and well thought out. Down the middle of the dining tables were clusters of stunning southern forest produce. There was also an abundance of potatoes which were those that you would consider ‘seconds’ to highlight the issue of food waste as they couldn’t be sold (oddly shaped, too small) but were perfectly good to eat. 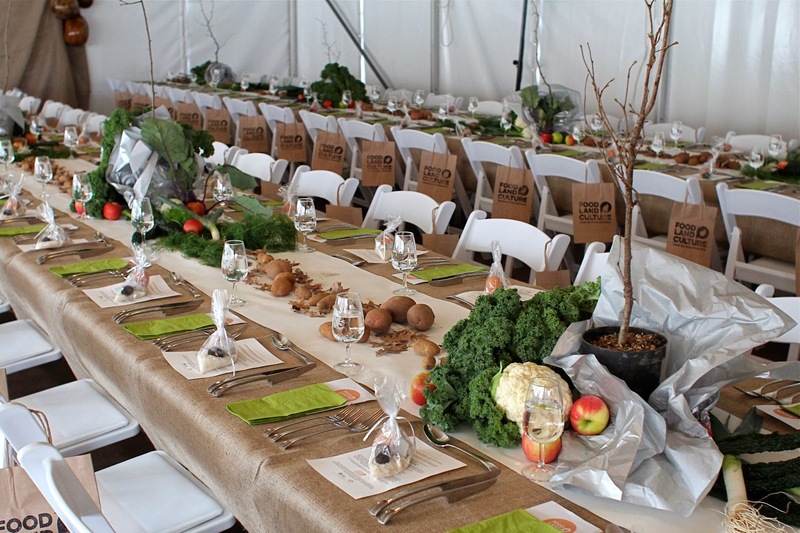 The idea was that after the lunch, diners would be asked to put together their own goodie bags and take whatever produce they wanted from the table. Produce that was farm fresh and tasted as fruit and vegetables should. At the end of the day, it was great to see no produce left on the tables, people had really embraced the concept and I imagine that when people cooked with the produce they had taken home, they would be thinking about where it came from. It’s crazy to think of all the food that gets wasted! The interesting thing is that in the developing world, waste mainly occurs due to the lack of resources and infrastructure problems during harvest and processing. In developed countries like Australia, most of the waste occurs at the retail level and by consumers – the rejection of perfectly good food for superficial reasons (?! ), as a result, we get things that look pretty on the outside but taste like nothing on the inside or throwing away food because we buy too much of it (!!). On the occasions when I do step into a supermarket, generally to buy non-food items (cleaning products, toiletries) or non-perishable food items (sugar, flour), I bypass the fresh produce section, but have noticed overtime how little variety there is and how strangely uniform everything seems. When did everything become so perfectly round or be the same size? This certainly doesn’t reflect human nature, we are of all different shapes and sizes. I don’t feel any love for these fruit and vegetables, not in the way that I would be if I was at a farmers market or grocers. I was recently introduced to Newy’s Vegie Patch in Kirrup which is along the way to Manjimup. It’s a fantastic little fruit and vegetable shop, with an amazing range of produce that is grown by the owners. When you walk in and see everything, you want a piece of all of it! Newy's Veggie Patch in Kirrup - my new love! In developing countries, waste can be solved by providing resources/infrastructure but in developed countries, it’s more about changing consumer behaviour – making the effort to shop at farmers markets rather than the supermarket, choosing to pay more for food even if there is a cheaper option. Not just basing purchasing decisions on the surface level but making people really think about where their food comes from and the broader costs. 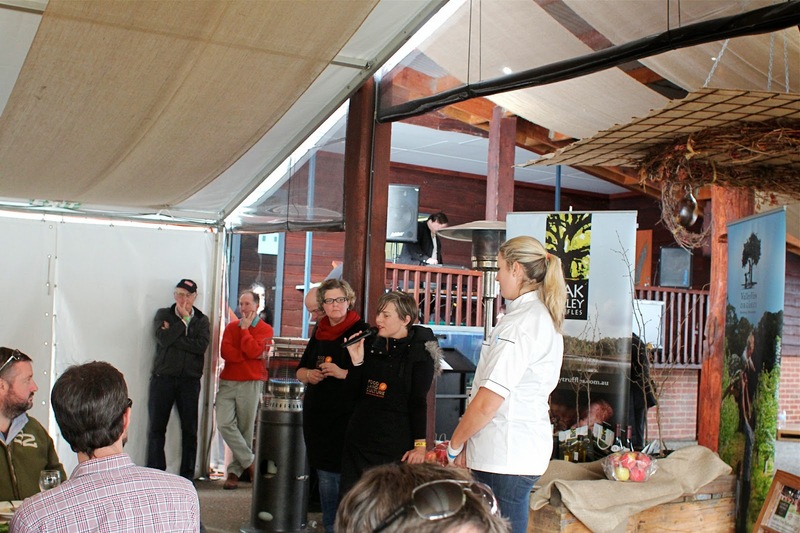 The Southern Forests Farmers’ Long Table was a satisfying lunch filled with great food that also left you with a great feeling, well maybe this was just me, because I’ve never been to an event before where the idea of ‘eating local’ was so well done and it felt honest too. Talk is cheap, you need to be a bit more immersed in it and engaged, and with the Food Land Culture, Long Table Lunch, I think everyone went home a bit more connected to the message because not only did we consume it – we were surrounded by it, we interacted with it and got schooled, and then we took some of it home. In the lead up to the event I followed Food, Land, Culture on Facebook as they sourced produce for the lunch. Excepting staples such as flour, sugar and salt, the chefs made everything from scratch from their “Genuinely Southern Forests pantry”. The chefs that cooked for the Sunday Long Table Lunch had come down from Perth – Kiren Mainwaring from Co-Op Dining, Joel Valvasori-Pereza from Lalla Rookh and Sophie Budd from Taste Budds Cooking Studio. 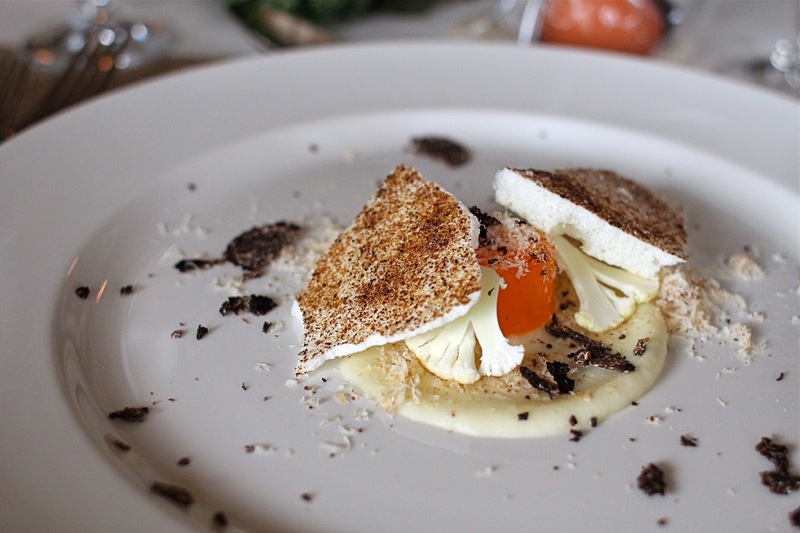 Kiren served up an entrée of slow cooked egg, savoury meringue, cauliflower puree, shaved cauliflower and fresh truffle. I have been served slow cooked egg by Kiren when I have dined at Co-Op Dining and Dear Friends, but this was different than the usual. Only the egg yolk had been slow cooked until it held together like jelly but nothing was wasted with the egg white turned into a savoury meringue. Matched with a flawless cauliflower puree, along with shaved fresh cauliflower, provided lots of contrasting textures and flavours. I liked how it reimagined simple elements that I have consumed numerous times before. Then we got an interlude with local potato growers Carlo and Bob Pessotto telling us about what they do and the diverse range of potatoes available. One thing that I also learnt from them was that you shouldn’t wash potatoes! When you buy potatoes, they should be covered in dirt as this protects its flavour, wash them just before you are about to cook them. This also makes a lot of sense when you think about how you should store potatoes – somewhere cool and dark (don’t let there be light!). But the potatoes you generally get are pre-washed, clean and smooth (this isn’t right!). 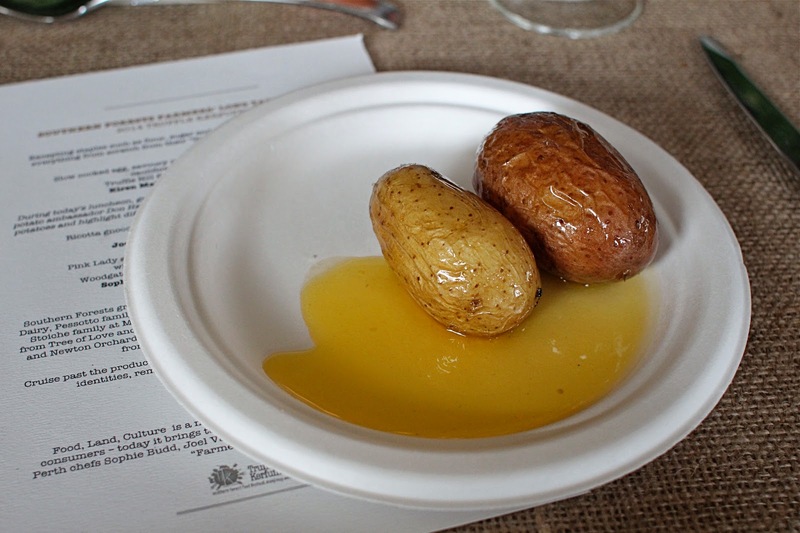 To further reinforce the message, we were served up two different kinds of potatoes (Laura and Kipfler), just simply roasted and generally doused with butter. 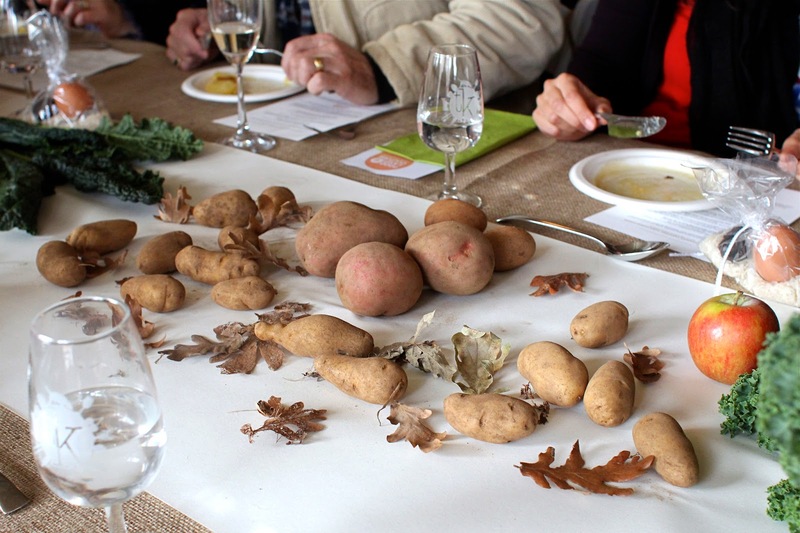 The purpose was for diners to taste each potato and take a moment to appreciate their individual unique flavours. Not all potatoes are the same and there are many different potatoes, but how many varieties do we use in our day-to-day cooking? 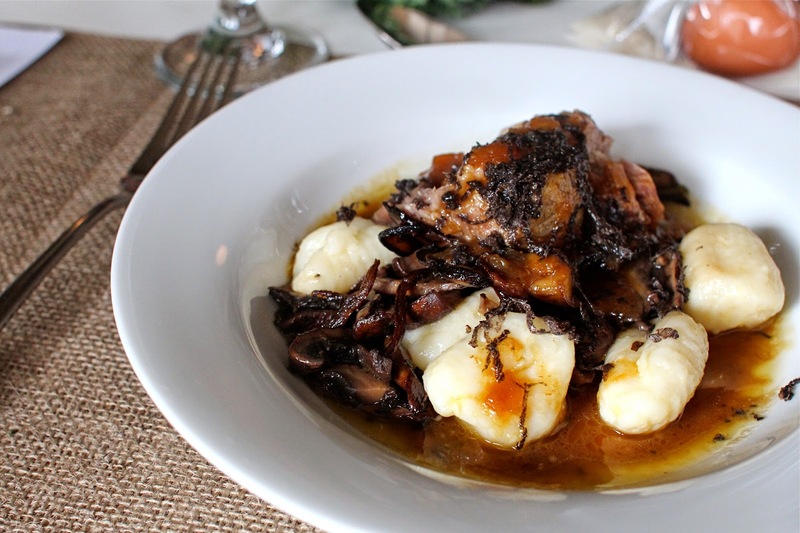 Joel provided the main of ricotta gnocchi, lamb and mushroom ragu with fresh truffle. What can I say? If I was going to recommend a place for Italian food in Perth, it would be Lalla Rookh, I’ve never had a disappointing meal there, the food is always exceptional and this main was damn good. Everyone raved about it, people who had gone to the Truffle Kerfuffle Hunt and Harvest Dinners or Lunch said that out of everything they had eaten over the entire weekend, this was the dish of the weekend. So what made it so good? The lamb was cooked until fall apart tender as expected but the sauce was the star, it was delicious, with so much depth to the flavour. The lunch finished with dessert from Sophie Budd. 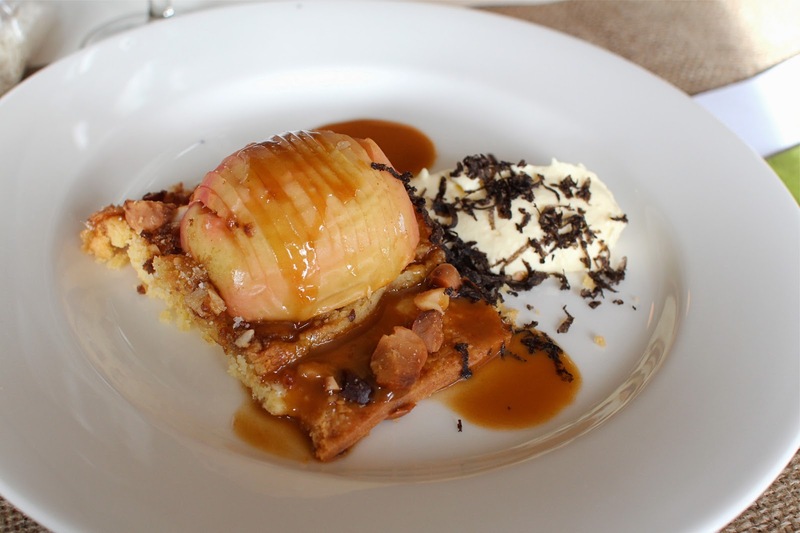 Pink Lady and hazelnut frangipane tart on rough puff pastry with clotted cream with shavings of truffle. Sophie explained to us that she was going to make puff pastry but the butter that she had made from scratch with Bannister Downs cream ended up being too wet and so this was the end result, a bit more rough, than puff. I loved the pastry, it was so short, buttery and crumbly and provided an excellent base for the Pink Lady apple. Some people talk the talk and after spending some time getting to know the woman behind Food, Land, Culture over the weekend, I know that they walk the walk. I also unintentionally ended up helping out (as Katrina kindly housed me and my sleeping bag) and I was proud to be a part of such a great event, and I got to experience a bit of both world’s where I learnt about what happens behind the scenes and then as a paying diner, I also got to sit down and enjoy the fruits of my labour. Unlike everyone else who was busy working at the Truffle Kerfuffle and didn’t have a proper meal until Sunday night when everything was over! Food, Land, Culture ladies - Katrina, Bella and Sophie! Eating locally also means eating seasonally and after my weekend at the Truffle Kefuffle, I must say I was truffled out! It’s an expensive but special treat, and I’m glad that it’s something that I get experience just once a year. I think you value things more when you can't get it all the time. Shouts out to all the food producers for the lunch. You guys are the real deal! The Southern Forest growers and producers celebrated at the Food, Land, Culture long table lunch were – Bannister Downs Dairy, Pessotto family’s Kari Country Gourmet Potatoes, CharCool Spring eggs, the Stoiche family at Manjimup Meat Mart, Oak Valley Truffles, the Edwards family from Tree of Love and Bioveg, Fontanini Fruit and Nut Farm, The Truffle & Wine Co, and Newton Orchards and Valleyview Organics. 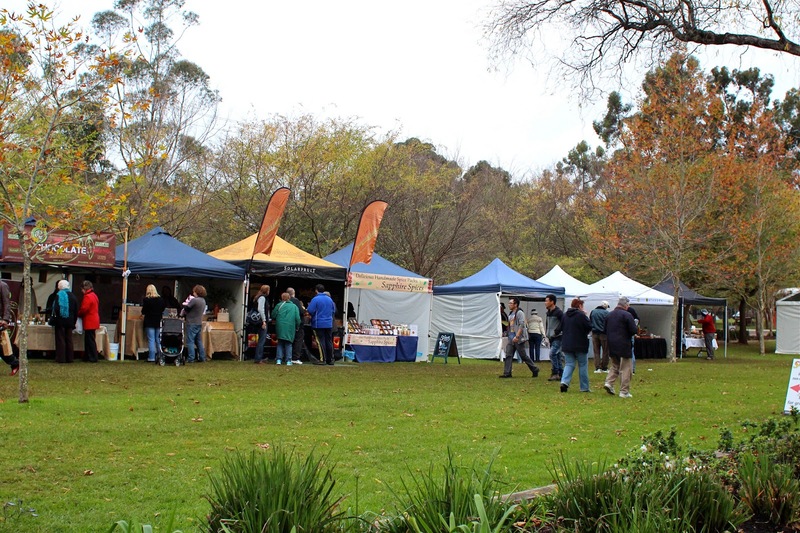 Plus, local wines from Woodgate, Batista Estate and Truffle Hill.